with our proven low pressure crack injection solution. The repair of leaking cracks is a natural extension towards basement flood prevention. Provide a dry and healthy basement environment with permanent concrete crack repair solutions in conjunction with the most complete pumps, controls and battery backup systems. Cracks in poured foundations typically form as a result of concrete shrinkage and pose no structural threat to the foundation. These cracks are usually vertical or diagonal and are no wider than 1/8″. Unfortunately, such cracks provide an easy entry for water and soil gases. For plumbers or contractors servicing pumps or any wet basement issue, the repair of leaking cracks should be a viable addition to one’s list of repair services. Previously, the default method for addressing leaking cracks was with drain tile, which is an expensive and cumbersome process while low-cost patching remedies provide only temporary relief before the cracks begin to leak again. 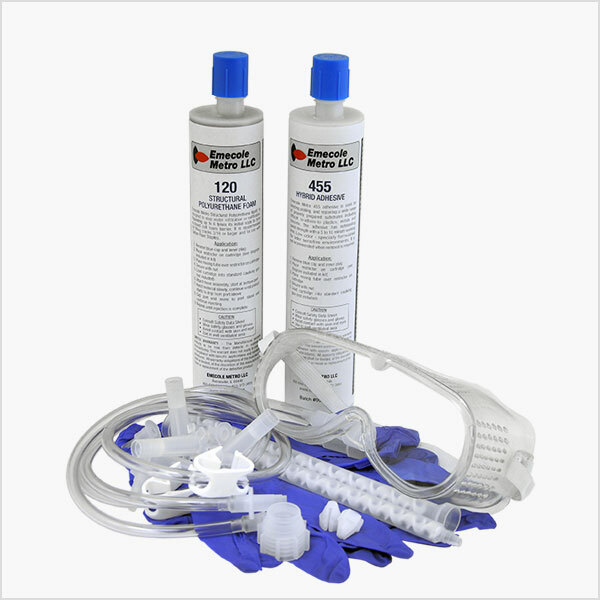 The most effective means for permanently repairing leaking cracks is with the low-pressure injection of polyurethane or epoxy. Our sister brand, Emecole Metro, was a pioneer in the development of the low-pressure injection process with their specially formulated injection materials and accessories. The end result is a more efficient and cost-effective concrete repair solution that completely fills cracks from front-to-back and top-to-bottom. 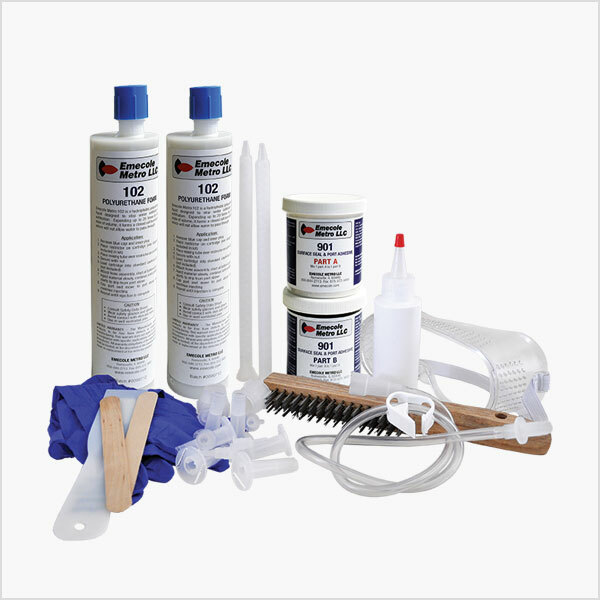 With a full arsenal of concrete crack repair and basement waterproofing products, Emecole Metro is the one-stop shop among concrete contractors, waterproofers, plumbers and remodelers when it comes to providing a dry and healthy basement environment. Basement wall crack repair makes for an ideal add-on service for plumbers, waterproofing contractors or remodeler who regularly installs sump pumps and is already spending time in the basement. 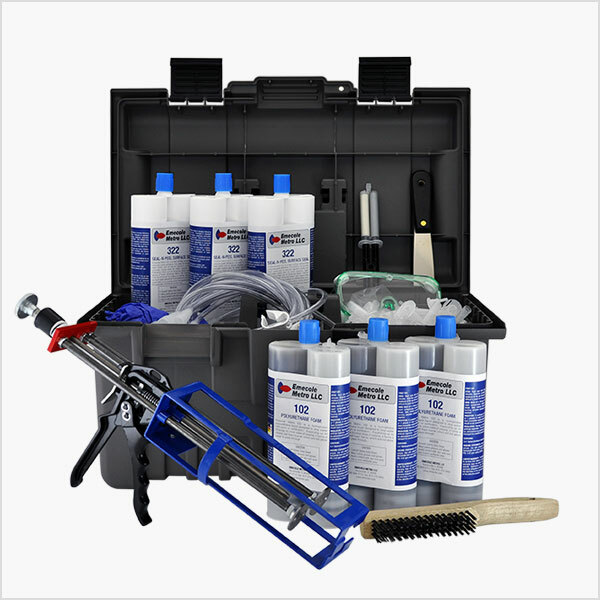 Emecole Metro’s fully equipped starter kits include all the necessary components to simplify repairs (components are also available individually or in bulk for easy re-fill). Emecole Metro also manufactures and supplies injection materials for the repair of structural cracks, in addition to cracks in concrete floors and slabs. Our entry-level starter kit. Use with a standard caulk gun. Requires no expensive add-on tools. Effective for repairing typical wet and leaking wall cracks up to 10 feet. Provides a permanent water stop by completely filling voids around basement wall pipes, as opposed to patch jobs which only seals the surface. Use with a standard caulk gun. Ideal for repairing multiple cracks. Includes dual dispensing gun with spring loaded high performance trigger, which provides a more effective and comfortable injection experience. To learn more about the concrete crack repair process and the full line of available products, the Emecole Metro team of basement waterproofing experts are ready to help.